NOTE: This is the first in a series of articles discussing aeromedical subjects of interest to Lancair owners & operators by Dr. Anderson. The recent crash of a Socata TBM 900, in which the unresponsive pilot was observed slumped in the cabin while the plane flew to fuel starvation, underscores the need for those who fly high performance aircraft to be aware of the dangers of hypoxia. LOBO pilots fit into this category. All Lancair airplanes are quite capable of flying above 12,500, which places their pilots and passengers at risk.Our brains runs on two things: sugar and oxygen, both delivered via the bloodstream. Blood oxygen saturation (PO2) in normal, healthy people will be 97-98% on the ground at home field elevation. The oxygen is bound to hemoglobin in red blood cells and delivered to the body’s cells via the circulatory system. As altitude increases PO2 decreases, as shown on the oxygen dissociation curve (Figure 1). 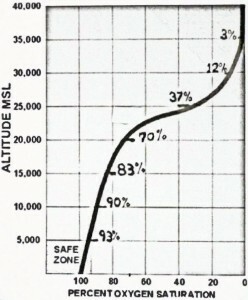 Note the small area marked “safe zone” on the graph is from sea level up to only 5,000 feet. At this altitude (5,000’) the PO2 drops to around 93%. This level is considered by medical personnel to be the lower limit of normal brain function. By looking at the graph you can see at 10,000 feet saturation has dropped to 90%. By 15,000 feet, PO2 is 83%. Most people at this altitude will develop symptoms of hypoxia (lack of oxygen) which may include vertigo, incoordination, dimmed vision, slowed thinking and rapid heartbeat. At 25,000 feet, PO2 in the atmosphere (37%) is less than the PO2 in the venous blood returning to the heart and consciousness is lost. The retina of the eye is affected resulting in decreased night vision. Instruments and maps are more easily misread. Ground features and lights are easily misinterpreted. NIGHT VISION degraded by 15-25%. Blood O2 saturation is 90%. Absolute highest altitude to trust your own performance. Your judgment is severely compromised even though you don’t think so. Blood O2 saturation is 85%. Serious decrease in judgment, memory, thought processes. If immediate action is not taken recovery is unlikely. Blood O2 saturation is 79%. Blood O2 saturation is 71%. 5-15 minutes of useful consciousness. Blood saturation at lethal levels. Reactions vary greatly among people and in the same person, day to day, due to body chemistry, general health and diet. Absolute altitude—The higher you climb, the lower the PO2. Acclimatization—Denver residents at 5,000 feet who fly to 10,000 feet have physiologically gone up only 5,000 feet. 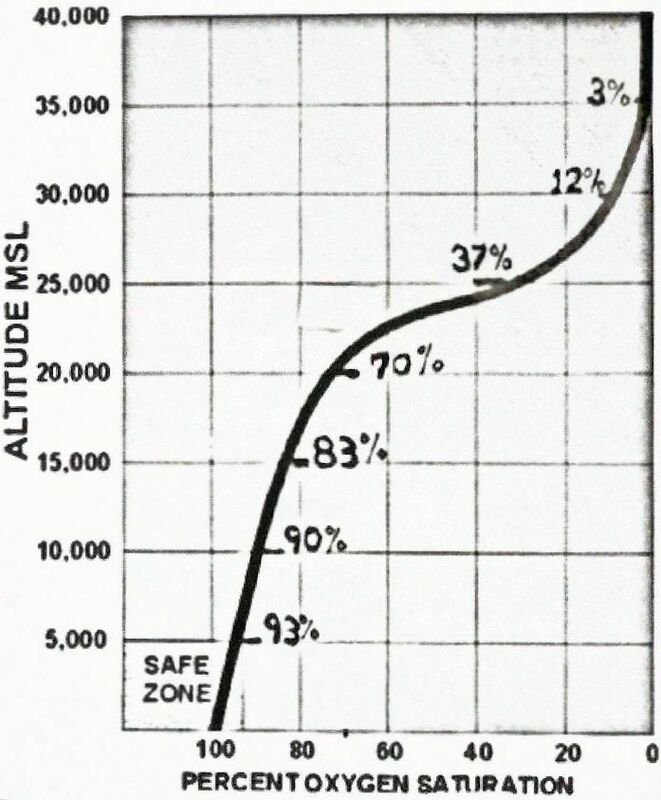 Conversely, LA pilots living at sea level who fly to 10,000 feet will experience a 10,000 foot change. Residents in the Andes above 17,000 feet have adapted to the extreme altitude; their bodies have produced more red blood cells, which means more hemoglobin to carry oxygen. Rate of Ascent—The quicker you climb, the more rapid the onset of hypoxic symptoms. For example, a rapid climb to 13,000 feet or higher in a non-pressurized high performance aircraft such as a Lancair Legacy can result in disabling hypoxia even before a pilot is aware of the peril. In a pressurized airplane, explosive decompression causes a rapid increase in cabin altitude which can reduce the time of useful consciousness by one-third or one-half. Fortunately the service ceiling for Lancair IV-Ps and Evolutions is 28,000 feet, allowing a rapid descent to a safe altitude should decompression occur. Temperature—Temperature extremes force the body to expend energy to maintain core temperature. The energy used will increase the need for oxygen and decrease tolerance for hypoxia. Fatigue—Mental or physical fatigue decreases both performance and tolerance to hypoxia, and hypoxia decreases performance and awareness of degradation of performance. This insidious cycle may continue to the point the pilot fails to recognize his poor performance and/or take corrective action. Alcohol—Any alcohol in the blood or cells hampers the body’s ability to take up and use oxygen. One ounce of alcohol raises the body’s perceived altitude by 2,000 feet. The alcohol can disrupt the normal sleep cycle which contributes to fatigue, which diminishes tolerance to hypoxia. The depressant effect of alcohol can cloud the pilot’s judgment to delay recognition of hypoxia. Smoking—Carbon monoxide attaches 200-300 times more readily than oxygen to the hemoglobin in red blood cells. Once bound it remains in the red cells until they die. The major source of carbon monoxide in the blood stream is cigarette smoke, either yours own or second hand. Smoking a pack of cigarettes can saturate 8-10% of available hemoglobin which raises the body’s perceived altitude by 5,000 feet. Hypoxia is insidious and progressive, and without training, almost undetectable by the pilot. Without supplemental oxygen at sufficient pressure you will gradually lapse into incompetence while maintaining an absolutely euphoric faith in your own ability. Time of useful consciousness can vary from indefinite at 10,000 feet to 9-12 seconds above 41,000 feet. The best way to prevent hypoxia is to avoid it entirely. Here's how you do it. These are available at most pharmacies, and major pilot/builder supply outlets like this one from Wicks Aircraft. I recommend you purchase one and carry it in your airplane for use while flying. Monitor your pulse oximeter closely the first few flight you use it at altitude to determine the altitude your PO2 falls below 93%. Use oxygen whenever your PO2 falls below 93%. Use oxygen when you climb above 10,000 feet during the day and 8500 feet at night in non-pressurized airplane. Use as needed. Recommended for both non-pressurized and pressurized airplanes. Although many people who have experienced hypoxia report similar symptoms, each person’s response (number of symptoms, order they appear, severity, etc.) is unique. The best way to combat hypoxia is to recognize the symptoms and act before you become incapacitated. The FAA provides Aerospace Physiology Training for pilots in Oklahoma City, OK. Call 405-954-4837 to schedule. This course includes time in the altitude chamber where you will experience hypoxia yourself so you can learn to recognize your body’s subtle symptoms early. An ounce of prevention by early recognition may prevent a ton of problems as flying skills deteriorate with the onset of hypoxia. For more information about high-altitude physiology see FAA Advisory Circular 61-107B. Dr. H. Allen Anderson is a United States Navy veteran and retired Ear, Nose & Throat/Allergy specialist. 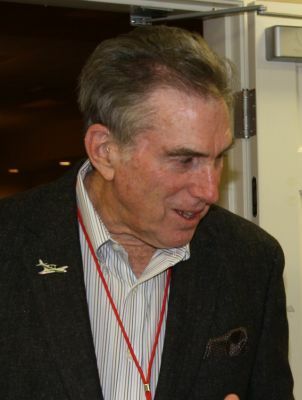 He's an FAA Aviation Medical Examiner and has been actively involved in aviation medicine for more than 35 years. During his two years as a Navy Flight Surgeon Dr. Anderson accumulated 50 catapult shots/traps and 200+ hours in the back seat of an F-4 while deployed to Viet Nam. 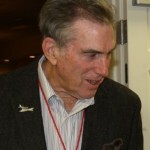 Among the planes Dr. Anderson has owned are two Pipers: a Lance and Aerostar 601P; several Cessnas: a T-210, P-210, 340 and P-337; a Mooney Ovation; and three experimental aircraft: the RV-6, RV-10 and a Lancair IV-P. He is currently working with Cascade Aircraft Management on his latest pride and joy, N52PE, the first piston Evolution, which is currently in flight testing.